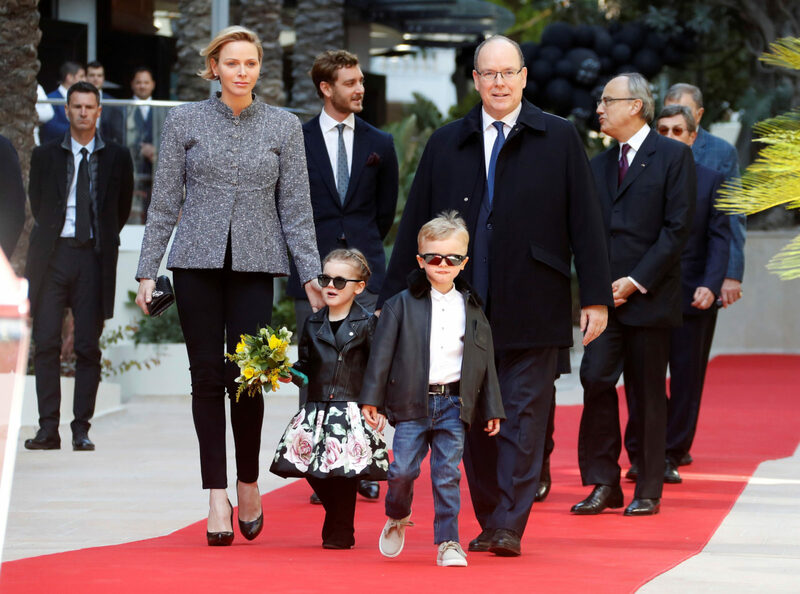 Their mother is renowned for her impeccable sense of style so it’s no wonder that Prince Jacques and Princess Gabriella looked absolutely adorable as they stepped out with their parents Princess Charlene and Prince Albert to open a new luxury complex in Monaco last week. The gorgeous four-year-old twins pulled out all the fashion stops as they walked the red carpet with their parents in stylish leather jackets and sunglasses. Gabriella wore a black floral dress, spicing up her outfit with a black leather jacket and matching boots. While her brother wore a pair of blue jeans, a white button-up and a black leather jacket. Meanwhile Princess Charlene, 41, looked stunning in a pair of tight-fitting black pants, paired with a patterned coat and a pair of black high heeled stilettos for the occasion. While her husband, the reigning Monégasque monarch, looked relaxed in navy smart trousers and a slightly darker blazer. Prince Jacques and Princess Gabriella looked so adorable as they stepped out with parents Princess Charlene and Prince Albert last week. The family joined forces to open the lavish complex, which has a pristine street named Princess Charlene Way, in honour of the royal. The new living area is located in the heart of Monte-Carlo and brings together a high-end residential set, luxury shops, a restaurant, offices and a conference centre just a few steps away from the casino’s famed square. It’s been a busy few weeks for the twins. Earlier this month they joined Princess Charlene for their first visit to Africa. The South African-born princess posted a video on her official Instagram account showing them in a safari. The twins were accompanying their mother for a visit to attend the aQuellé Midmar Mile — one of the world’s largest open swimming events, and one that Princess Charlene has participated in herself. Like her late mother-in-law Grace Kelly, Charlene joined the royal family as an outsider having no royal connections of her own prior to meeting Prince Albert. Charlene met Albert at a swimming competition in 2000 – the same year she represented South Africa in the pool at the Sydney Olympics. She has since thrown herself into royal life with her days filled of official engagements and charity work. She’s a regular fixture on Europe’s royal scene and has earned a reputation as a down-to-earth princess who’s not afraid to roll up her sleeves and do the hard work. She also regularly accompanies her husband to glamorous events in their home country throughout the year, with fashion magazines eagerly awaiting to see what stylish outfit she’s picked for the red carpet. Are you a fan of Princess Charlene? Do you like Monaco’s royal family?